Phil has been fly fishing for over 30 years. His love of fly fishing has taken him across North America pursuing trout, Atlantic and Pacific salmon, char, pike, walleye and numerous other species on the fly. But Phil is best known for his stillwater exploits. 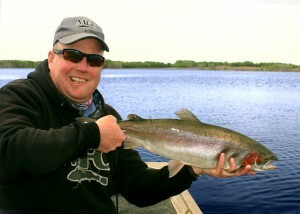 A former commercial fly tyer, Phil has written for almost every major fly fishing publication in North America. He has authored three books and numerous feature articles and two regular columns. Phil’s first book, Fly Patterns for Stillwaters is a best seller. In 2014 Phil was the proud recipient of a Life Time Achievement Award from Fly Tyer magazine. In addition to his writing, Phil has four instructional DVD’s. In 2007, Phil was a member of the gold medal winning team at the Canadian Fly Fishing championships. Phil has appeared on a number of television shows including BC Outdoors Sports Fishing, Sport Fishing B.C., Fishing Alberta, Let’s Go Outdoors and Fishing with Shelly and Courtney. Phil periodically co-hosts episodes of the New Fly Fisher, an educational fly fishing production. Make a point of visiting or following Phil on-line at the above URLs and through his social media channels, You Tube, Facebook, Twitter and Instagram.